Getting rid of moths doesn’t have to be challenging, but it is important to use care in determining what method to use. 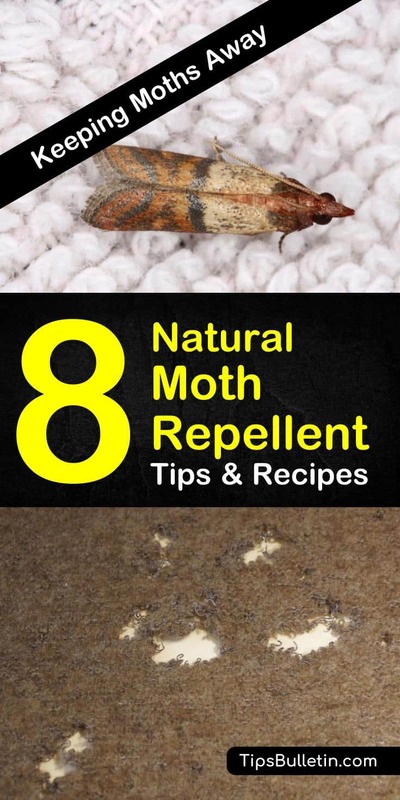 With mothballs containing paradichlorobenzene, which is known to cause all kinds of health issues, not everybody wants to use this conventional method for moth control. Another problem with mothballs is they are hazardous if swallowed, especially for children, and quite frankly they stink. Rather than take the risk, many people opt for a natural moth repellent. Before you use a homemade moth repellent to protect your clothes or other wool items you want to make sure everything has been freshly laundered and cleaned before storing. For the best protection, you want to seal away your items in plastic storage bags along with a sachet containing a natural moth repellent. After you make this sachet, you can use it in a variety of ways. You can hang it on the hanger containing wool items, you can place it in boxes with wool items, or you can stash it in your doors to keep moths at bay. Break up cinnamon sticks and mix with southernwood inside a bowl. Lay out all three handkerchiefs. Divide the dried herbs up into three equal portions. Place an equal amount in the center of each handkerchief. Gather the four corners and secure in place with the ribbon. You can make fabric envelopes using cloth you have around the house, or you can use cheesecloth or muslin bags. The ingredient cedar wood keeps also spiders away along with other insects for all natural pest control. Using equal amounts of the above listed dried herbs, mix in a medium container. Place about ¼ cup of the herb mixture into the bags or fabric envelopes. Place bags around the house, inside closets, drawers, cupboards, and even under beds. Bags need to be scrunched occasionally to release the herbs scents. Once the smell is no longer present, empty and refill bag or fabric envelope. The dried herb mixture can also be put directly into bowls and placed around the house. Mint leaves are a natural moth repellent. You can use dried mint leaves inside a sachet as a homemade moth repellent, or you can spread the leaves loosely throughout your drawers. Peppermint essential oils work in place of mint leaves. Apply several drops of peppermint oil to a cotton ball and set inside the corners of your closet. Herbs sachets help get rid of moth infestations, and they work great at preventing them, but they only go so far. To rid your home of a moth infestation or to prevent one from happening to you, make sure you are storing your clothes and other wool items properly. Wash clothes with vinegar and dry outside in the sunlight at the end of the season to kill any moth larvae before you store the clothes away. Sealed containers, such as plastic storage containers, suitcases, or cedar wood chests, allow you to store items where moths can’t get to them. Seal suits and wool coats in garment bags before being placed inside airtight containers. Avoid storing clothes in the garage or your basement, as these are moist environments where moths thrive. Clothes need to be stored in a dry area of your home like the attic or under your bed. By luring male moths to a pheromone trap you reduce the number of moths that are mating, so you have fewer eggs and larvae around your home. Hang or discreetly place cardboard tent pheromone traps around the house to attract clothes and carpet moths. As the moths are lured to the trap, they get stuck in glue. Replace traps as needed. Clothes moth traps work inside a chest of drawers, walk-in closets, and under beds. Purchase the traps from a retail store or online. The traps are free from pesticides and the odor associated with mothballs. Moths are repelled by any clean or floral scents, such as rosewater. Rosewater works wonderfully on its own to repel moths but becomes an even stronger natural moth repellent when mixed with essential oils. Use either a single oil or a combination, but take note that the floral smelling ones don’t last as long as the acidic or balsamic scents. Some essential oils you can choose from include grapefruit, peppermint, eucalyptus, bergamot, orange blossom, lavender, clove, cedarwood, sandalwood, and geranium. Mix all ingredients in a spray bottle. Shake well before spritzing in the air. Spray the air two to three feet away from wool and other fabrics you will be storing. Cedar rings or blocks work well as a natural moth repellent. You can place the cedar rings on a string and hang inside the closet or place the chunks of cedar along the shelves to deter moths and other household pests. As the aroma fades, the red cedar becomes less effective at deterring moths. Sand the wood to refresh the scent every few months. To kill any moth eggs you will need to use cedar oil, as it is the only thing proven to kill the eggs. For a moth-free home, you need to keep your home clean, as adult moths are attracted to dirt. Keeping your carpet and baseboards clean by vacuuming regularly won’t kill moths, but it will prevent them. Change vacuum bags frequently to ensure moth larvae aren’t inside your home. If you currently have clothes moths, wash your clothes in hot water and dry on high. The high temperatures will kill any moths, as well as their larvae. For non-washable fabrics, place inside a plastic bag and freeze for at least 12 hours. The freezing temperatures will kill eggs, larvae, and adult moths. Pantry moths are a nuisance. Cleaning your pantry from top to bottom and throwing out any opened and infested food is a must. Once your pantry is cleaned, place fresh or dried bay leaves along the shelves of your pantry to keep moths at bay. Replace bay leaves regularly for best results. Thank you for reading this post on natural moth repellent tips and recipes. 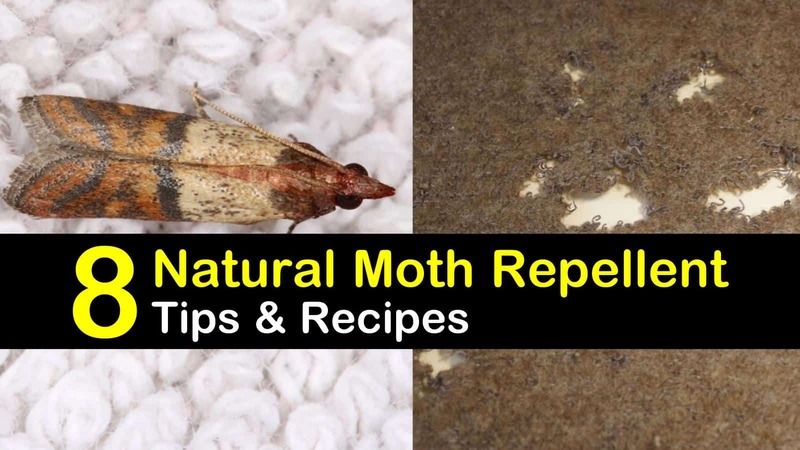 If you are anti-moth and have found any of these natural moth repellent tips and recipe useful, please take a minute to share the laundry tricks on Facebook and Pinterest.